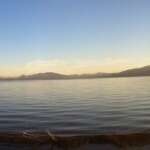 The swim sessions were, for me at least, the surprise highlight of the training camp. Where bike rides split us into groups by ability and the uptake for runs was variable we all came together at the pool. Once the session started – in some cases this took time – the athletes did what they were told, there was the occasional quibble of course, but when they were told ‘no pull buoy’ for a set, there was no pull buoy. At the end of a full day of training they pushed through long sets and, more importantly, enjoyed it. The added bonus was testing them the following week and seeing improvements on their critical swim speeds – the work paid off. While the athletes focussed on swimming I captured the sessions in high definition video, using the GoPro camera on deck and sometimes below the surface. After several evenings and a weekend of editing – film is harder work than blogging – four hours of footage became the 4 minutes of highlights below. The key moments are in there: the time it took to get certain individuals – I’m thinking of those wearing wetsuits in the fast lane – into the pool; the entertainment of watching triathletes swim medley; near misses after tumble turns; Steve fighting the water every inch of the way; and central to the video Sam collapsing on deck. I should make it very clear that no athletes were harmed in the making of this film; during a hard set late in the week, Sam did need a lie down and chose to take it right by the poolside, but he was fine. Mainly I hope the clip shows the athletes working hard in the pool, because that’s what they were doing. 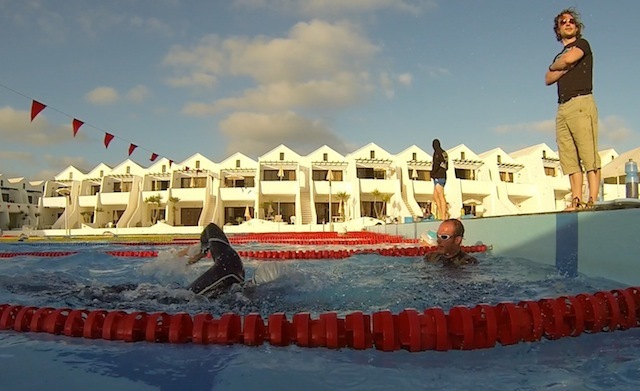 Before camp I was becoming jaded by the ‘typical’ age group triathlete attitude to swimming – there is little love for the pool, poor return on investment is often cited and even, on occasion, resistance to technique improvements (because that’s just how they swim). I understand the arguments, they often make sense, return on investment is poor, but I don’t understand training without a desire to become better. 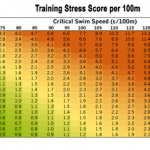 Complacency in the pool is a different matter to the conscious choice to swim less and better utilise that time. Within this framework it can be hard for a coach to sustain their own enthusiasm for swimming. After camp, seeing athletes swimming hard, doing what they are instructed and pushing themselves to improve, my enthusiasm is back in full. With time and the right environment, easily achieved on a training camp, but harder at home, triathletes will swim effectively. When I am coaching poolside I can help ensure it is the right environment, remotely I can ensure it is the right session. There are those I can and should push harder.